Revenue in the Online Food Delivery segment amounts to US$39,369m in 2019. Revenue is expected to show an annual growth rate (CAGR 2019-2023) of 9.1%, resulting in a market volume of US$55,870m by 2023. The market's largest segment is Platform-to-Consumer Delivery with a market volume of US$22,778m in 2019. In global comparison, most revenue is generated in China (US$39,369m in 2019). The eServices market segment Online Food Delivery contains the user and revenue development of two different delivery service solutions for prepared meals: (1) Restaurant-to-Consumer Delivery and (2) Platform-to-Consumer Delivery. Revenue includes the gross merchandise value (GMV) which is defined as the total sales dollar value for merchandise/food sold through the Online Food Delivery marketplace. Online Food Delivery comprises services which deliver prepared meals and food that was ordered online for direct consumption. The Restaurant-to-Consumer Delivery segment includes the delivery of meals carried out directly by the restaurants. The order may be made via platforms (e.g. Delivery Hero, Just Eat) or directly through a restaurant website (e.g. Domino's). The Platform-to-Consumer Delivery market segment focuses on online delivery services that provide customers with meals from partner restaurants that do not necessarily have to offer food delivery themselves. In this case, the platform (e.g. Deliveroo) handles the delivery process. Not included are orders by telephone, unpacked food for immediate consumption as well as non-processed or non-prepared food (e.g. HelloFresh). All revenue figures refer to Gross Merchandise Value (GMV). 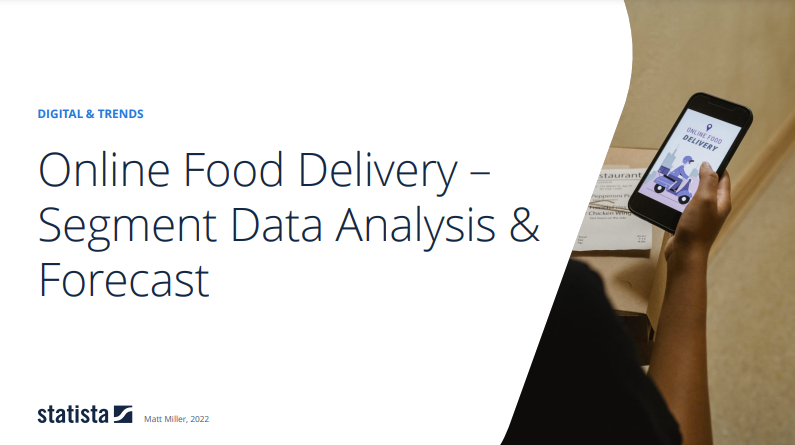 Reading Support Revenue in the Online Food Delivery segment amounts to US$39,369m in 2019. Reading Support The Online Food Delivery segment is expected to show a revenue growth of 12.5% in 2020. Reading Support In the Platform-to-Consumer Delivery segment, the number of users is expected to amount to 439.4m by 2023. Reading Support User penetration in the Online Food Delivery segment is at 35.8% in 2019. Reading Support The average revenue per user (ARPU) in the Platform-to-Consumer Delivery segment amounts to US$68.80 in 2019. Reading Support In the year 2017 a share of 35.3% of users is 25-34 years old. Reading Support In the year 2017 a share of 50.6% of users is male. Reading Support In the year 2017 a share of 39.2% of users is in the high income group. Reading Support With a market volume of US$39,369m in 2019, most revenue is generated in China. Reading Support With a rate of 42.3%, the user penetration in the Online Food Delivery segment is highest in Hong Kong. Here you can find more studies and statistics about "Online Food Delivery".